3 Bedroom charming cottage, just steps to Lake Ontario and gorgeous sunsets at waterfront park!! This cottage is ideally situated in a quiet pocket of town but still minutes to the very best that Niagara-on-the-lake has to offer! Cultural amenities, restaurants, shops are a short walk away or only a few min driving!! Just steps to a beautiful waterfront park where you can relax and enjoy the stunning lakeviews and also watch the sunsets! This lovely cottage has been recently updated inside out with new furnishings, ready for your memorable vacation. Two bedrooms come with a queen bed, one bedroom with a double bed and cozy living room with a comfortable couch. The kitchen is equipped with everything you would need for your family cooking while the patio area with a BBQ grill is the perfect space to enjoy your outdoor gathering! With a full bathroom, laundry washer & dryer, gas fireplace, air conditioner and Hi-speed Wi-Fi internet, this cottage has all you need for your dream vacation! **Before sending the reservation request, please double check the rate and the total quote for your booking dates as rates change for the different seasons. If you're from Canada, please make sure to check the rate in 'Canadian' currency. Recently spent two wonderful nights at the very charming Lakeview Cottage. A really chill and relaxed vibe that is a stone's throw away from spectacular lake/beach and only a short walk to the Historic NOTL district. The surrounding properties magnificent! Greeted with a lovely bottle of wine upon our arrival. Accommodated 5 adults very comfortably. Joshua was absolutely wonderful to deal with. He responded almost immediately to my many questions and was very flexible and accommodating. Overall exceeded our expectations and would most definitely rent again. This is the back yard...! The cottage is cosy and snug--excellent beds, fine working kitchen, pretty surroundings--and its access to the jewel-box town of Niagara-on-the-Lake and the overlook and beach of Lake Ontario are unparalleled. Walking the hundred yards from the house to the lake, in bathing suit and bare feet, is a childhood experience, even for 50-somethings, because the water is clear and bright, the view across to Toronto obstructed only by sailboats, and the pleasure of skipping rocks at sunset diminished only by the competition from the decorous children of other beachgoers. If you know Yeats' "Lake Isle of Innisfree," you've seen this cottage, and if you know Dylan Thomas' "Holiday Memory," you've been at this beach. Perfect for our family of four. Not so fancy that we worried about the kids harming things. Uncluttered. Loved the park and little beach on the lake down the street. We ate breakfast there on the picnic tables. The best feature of this rental is its location: a quiet street, within biking (but not walking) distance of Queen Street) and close to a park/beach on Lake Ontario. Note: despite the name and photo, there is no "Lakeview" from this cottage. But it is a cottage, an old small one that has been updated. Main room and one bedroom are large; other two bedrooms, the one bathroom, and the kitchen are small and feel cramped. Everything was clean, and the kitchen well outfitted (but no coffee or filters for the coffee maker). We appreciated the speedy wifi and the backyard table and chairs. It worked for us (two couples), but feel like we could do better for the price elsewhere. As described on the listing detail, the lake is steps away and actually you can see it from the front of the house. We had a wonderful experience staying at the Lakeview Cottage. Joshua was so prompt in his replies and was very accommodating for our arrival which was sooner than the check in time. There was a bottle of red wine waiting for us and the home was very clean, spacious for all five adults and was very comfortable. We cooked one dinner and found the kitchen well equipped with the things we needed. Walking to the Shaw Festival for a few plays was great since we enjoyed the walk by the waterfront and/or through the residential areas with the beautiful gardens and homes. 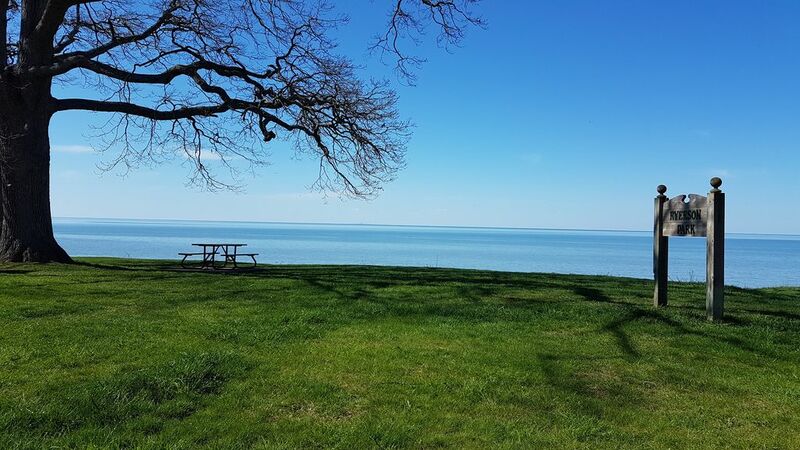 We would definitely rebook with Lakeview Cottage again on our next trip to NOTL! Thank you for your great review and glad to hear your enjoyed your stay :) I look forward to serving you again soon! !